A transit of Venus across the Sun as seen from Mars takes place when the planet Venus passes directly between the Sun and Mars, obscuring a small part of the Sun's disc for an observer on Mars. During a transit, Venus could be seen from Mars as a small black disc moving across the face of the Sun. No one has ever seen a transit of Venus from Mars, but the next one will take place on August 19, 2030, and could be observed by space probes or hypothetical Mars colonists. 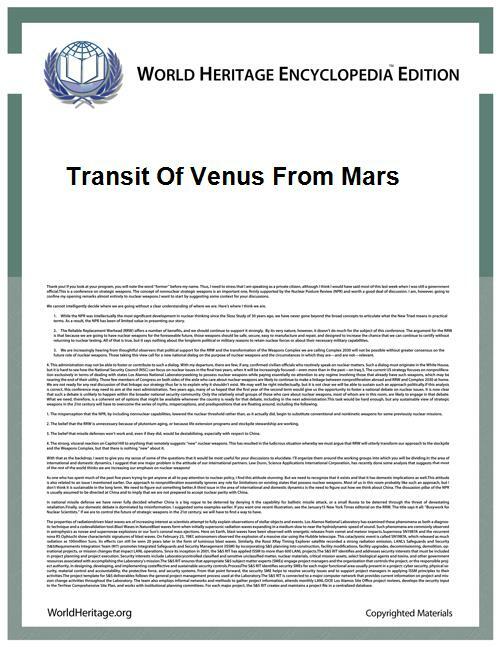 Transits of Venus from Mars occur much more often than transits of Earth from Mars, and also much more often than transits of Venus from Earth. The Venus-Mars synodic period is 333.92 days. It can be calculated using the formula 1/(1/P-1/Q), where P is the orbital period of Venus (224.701 days) and Q is the orbital period of Mars (686.98 days). The inclination of Venus' orbit with respect to Mars' ecliptic is 1.94°, which is less than its value of 3.39° with respect to Earth's ecliptic. Transits can be grouped within series similar to the Saros series for lunar eclipses or the series for transits of Venus from Earth. Within each series, the transits are separated by 24042.45 days (just under 65 years and 10 months). 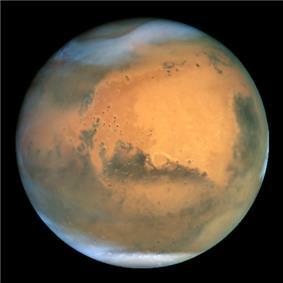 This corresponds to 72 Venus-Mars synodic periods, or 35 Mars orbital periods, or 107 Venus orbital periods. These groupings can be calculated by dividing the synodic period by the sidereal orbital period of Mars or Venus and converting this ratio into a continued fraction. For example, dividing the synodic period (333.92 days) by the sidereal orbital period of Mars (686.98 days) gives the decimal 0.48607, which can be approximated by the continued fraction [0;2,17,2] giving a ratio of 35/72. Using the sidereal orbital period of Venus gives the decimal 1.48607 with the same result. In the table below, series names beginning with "A" are near the ascending node with respect to the Martian ecliptic, and occur when Venus has an angular diameter of approximately 23–24". Series names beginning with "D" are near the descending node with respect to the Martian ecliptic, and occur when Venus has an angular diameter of approximately 18–19". The simultaneous occurrence of a transit of Mercury and a transit of Venus is extremely rare, but more frequent than from Earth, and will next occur in the years 18,713, 19,536 and 20,029. On several occasions an almost identical event is predicted: a transit of Mercury and a transit of Venus, or transit of Earth will follow themselves, one after the other, in an interval of only several hours. On January 16 18,551 transits of Mercury and Venus are separated by 14 hours. The simultaneous occurrence of a transit of Venus and a transit of Earth is extremely rare, and will next occur in the year 571,471.